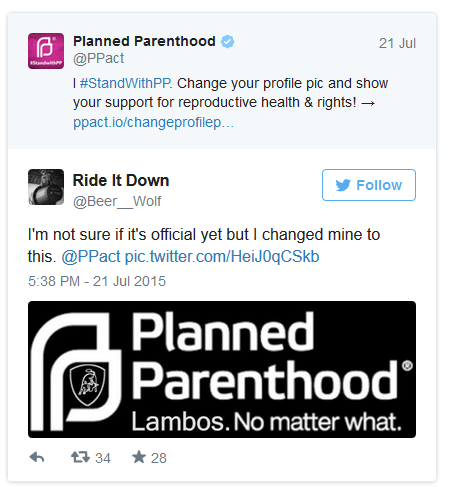 Planned Parenthood has been embarrassed on Twitter several times, in light of two investigative videos released from the Center for Medical Progress. 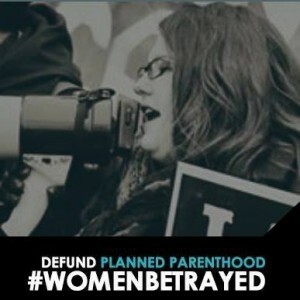 The videos show Planned Parenthood’s top employees talking about their fetal parts business – something that has outraged Americans since the first video came out on July 14. 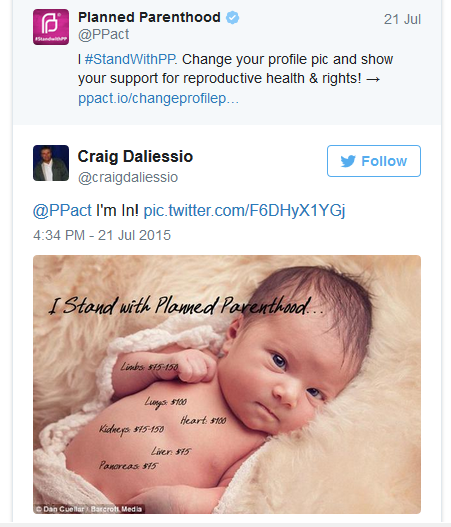 Now apparently, the abortion giant wants to be embarrassed on Facebook, too. As Twitchy has showcased, Planned Parenthood is asking its supporters to change their profile pictures to a pink hue over the person’s face, with #StandwithPP. 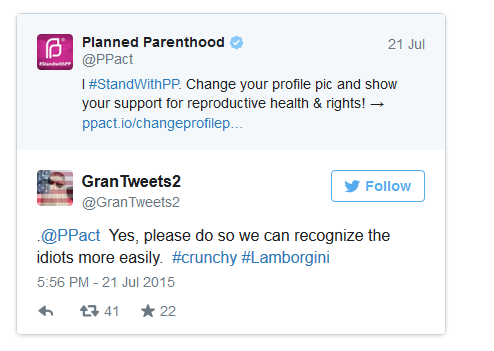 Planned Parenthood has tweeted out that the change will “show your support for reproductive health & rights!” Twitter users did not take too kindly to the idea, and came up with their own hashtags and pictures. 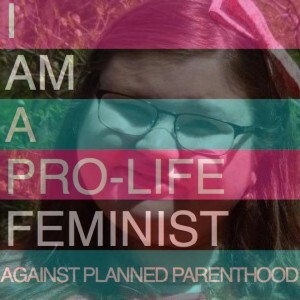 While I have yet to see Facebook friends of mine change their profile pictures in the way Planned Parenthood has suggested (and yes, I do have friends who support Planned Parenthood), I have seen friends change their profile pictures in other ways. 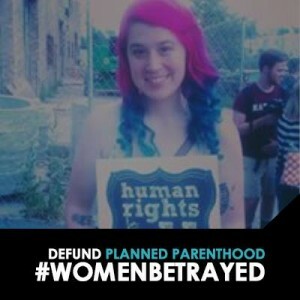 Kristan Hawkins, president of Students for Life of America, has changed her profile picture to call attention to her group’s rally, #WomenBetrayed, which will take place in several cities on July 28. 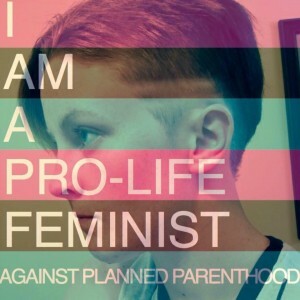 And it’s not just those who are a part of Students for Life who have changed their profile pictures to support the women and children Planned Parenthood preys upon. Planned Parenthood’s efforts show that the abortion giant is very much on the defense, and desperately so. Planned Parenthood once again claims they “aren’t fooled,” and that they “fight for women’s healths and rights…” They also sneak in their #StandwithPP at the end. 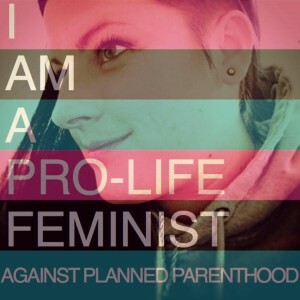 To see who is truly harming women – never mind disrespecting the dead bodies of the babies they’ve already callously aborted – Planned Parenthood needs only to look in the mirror. 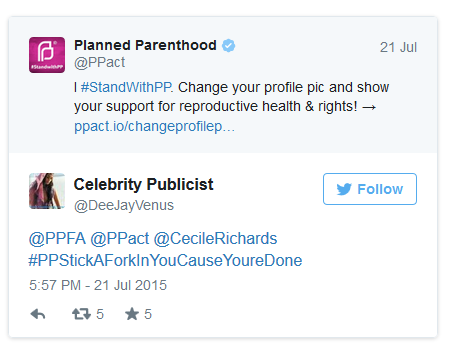 In the meantime, the abortion giant’s attempts at damage control on social media are working against them, as such efforts are embarrassing Planned Parenthood time and time again. Of course, it also provides us sensible people with a small bit of amusement amidst all the horror.